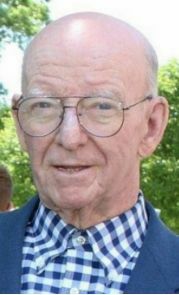 Francis "Frank" Xavier Burke, 83, of Manteo, N.C., passed away in his sleep on Dec. 11, 2016, at Peak Resources Outer Banks. He is survived by his wife of 21 years, Catherine "Kitty" Burke. Born Feb. 28, 1933, in Dunmore, Pa., he was the son of the late Mary and Joseph Burke. Frank joined the Air Force in 1952. He completed Officer Candidate School and trained as a pilot, flying the F-86 Saber and the A-10 Warthog during his 36-year military career. He served in both Korea and Vietnam, and retired in 1988, having attained the rank of colonel. Frank worked at the Pentagon following his military service, leaving the government as a GS-15, the highest grade in federal civil service. He worked in the private sector at SAIC and Robbins Gioia as a computer analyst before retiring in 2005. Frank also founded and operated the Elk Creek Country Store in Bumpass, Va., near Lake Anna. In 2005, Frank and Kitty moved to Manteo, N.C., where he loved living and walking the waterfront with his dog, Otis. He was a member of the American Legion Department of Virginia and the National Active and Retired Federal Employees Association. Frank enjoyed watching football and was a devoted fan and season ticket holder for many years of the Washington Redskins. In addition to his parents, Frank was predeceased by eight siblings and his son, Patrick Burke. In addition to his wife, Kitty, he is survived by his daughter, Colleen Washington; and his sons, Frank Burke Jr., Timothy Burke and Joseph Burke. Also surviving are Frank's former spouse, Beatrice Burke; stepchildren, including Kitty's children, Paula Bingham, Carol Yuill, Craig McManamay and Ronald McManamay; and Papa Frank's many beloved grandchildren and great-grandchildren. A funeral will be held at 1 p.m. on Friday, Dec. 16, 2016, at Twiford Colony Chapel, Manteo, N.C., with the Rev. Jerry Cribb and the Rev. Dr. John Dutton officiating. Burial will follow in Manteo Cemetery. The family will receive friends and relatives at the funeral home on Thursday evening from 6 to 8 p.m.
Twiford Funeral Home, Manteo, N.C., is assisting the family with arrangements. Condolences may be expressed at www.twifordfh.com.